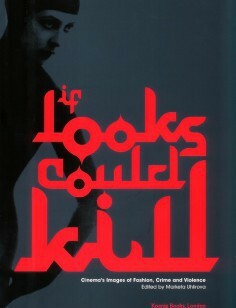 From stolen pearls to a glove left at the scene of the crime, an excess of red lipstick or the postmodern gangster silhouette, If Looks Could Kill explores the compelling links between cinema, fashion, crime and violence. Tackling themes such as disguise, the expression of desire, juvenile delinquency and the corruption of beauty, this volume features a string of underworld characters (and their prosecutors) whose highly effective styling and sartorial gestures helped define cinematic genres from detective to thriller, gangster, film noir and horror. Edited by Marketa Uhlirova, Co-founder, Director and Curator of London’s Fashion in Film Festival, If Looks Could Kill features an extensive line-up of new essays on fashion and crime in cinema by acclaimed writers including Tom Gunning, Elizabeth Wilson, Caroline Evans, Roger K. Burton and Charlie T. Porter. Available through University of the Arts shop.